In my pre-child days, I often got by with just a bottle of water and a fruit-flavoured lip balm. Now, of course, food goes everywhere my daughter and I go. 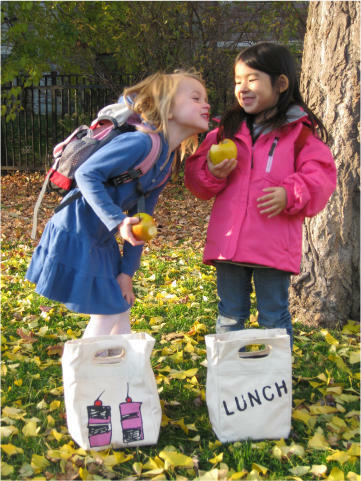 This leads to the necessity of a lunch bag – and a good one at that. It has to be durable, practical, easy to use, fit a whole lunch including drinks (sometimes even two lunches!) but most of all it has to be design driven and in impeccable taste. The two-woman Toronto-based company FLUF fills this lunch bag brief and then some. In collaboration with illustrator Matthew Langille, they’ve designed and produced lunch bags that I’d be happy to carry which means my daughter will go mad over them. The design is simple with a snap closure, is easy for kids to carry and the fanciful original illustrations will be a hit. 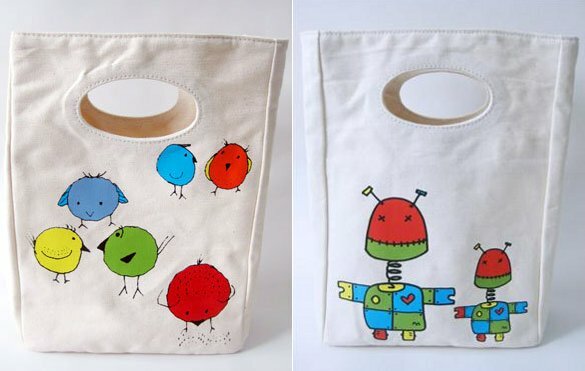 I adore the ‘Milkshake’ design featuring two delectable milkshakes topped with red cherries and the too-cool-for-school ‘Chirp!’ and ‘Robot’ bags (pictured above) are bound be very popular as well. The icing on the cake is that their lunch bags are made from 100 per cent certified organic cotton with water-based inks, are washable, wipeable and rinsable with no toxins, phthalates, BPA or waste. I can’t ask for anything more. Priced at CAD$17.95, they’re available to pre-order now for early May delivery. You’ll need to organise a freight forwarder or contact FLUF directly for postage to Australia.